Premier of Nevis and Minister of Tourism, the Hon. Joseph Parry is thrilled with the large number of visitors coming specifically to Nevis via the Air Canada direct flights to St. Kitts RLB International from Toronto, Canada. 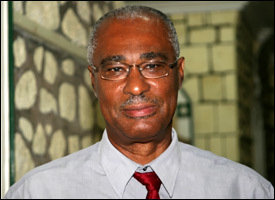 During an interview with the Department of Information Wednesday morning, Premier Parry stressed that it was important to achieve the islandâ€™s 2012 tourism targets, especially in light of the weak global economy. â€œCanada has been faring well financially compared to traditional sources of Nevis visitors such as the United States and Great Britain.Â I truly believe the Air Canada direct flight will be of a great advantage to our Tourism sector on both islands,â€ commented the Premier. Nevis has six hotels which are participating in the St. Kitts â€“ Nevis Air Canada package, namely: The Four Seasons Resort, Montpelier Plantation Inn, Nelson Spring Beach Villa and Spa, Nisbett Plantation Beach Club, Oualie Beach Resort and Mount Nevis Hotel. Each resort on Nevis offers specials, such as the Four Seasons Daily Resort Credit and the Montpelier Plantation $500 Resort Credit, while the Nisbett Plantation Beach Club offers free nights in cases of advanced bookings, and the Mount Nevis Hotel gives the 6th and 7th nights free. The Air Canada flight AC1778 operates from Toronto every Friday through to April, and is the only non-stop commercial air transport from Canada.Â The commercial flight uses an Airbus 319 aircraft with 108 Economy Class seats and 12 Business Class seats. According to the Air Canada webpage, â€œNevis is truly one of the remaining un-spoilt places of the worldâ€.